(1) The measure of clan times in this chart used these DPI settings. (2) Sweeping time only, does not include preview or transfer time. (3) Time required to scan a ten page article, clean it up (e.g. deskew, remove fan & gutter), send the article and update the system. 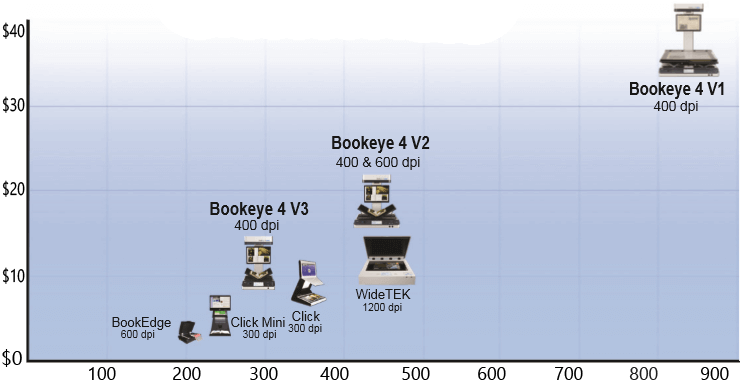 (4) Bookeye 4 V2 comes standard with 400 dpi max and has a 600 dpi upgrade option. (5) Turning pages is much faster with a planetary scanner than with a flatbed. (6) Scanning 2 pages at a time (to increase speed) is not book spine friendly. (7) Scanning 1 page at a time using edge of scanner.